1. Yesterday the lab results from my annual physical came back and they informed me that I'm in early menopause. So that means, according to the film they suggested I watch called "Hot Flash Havoc" (really? ), I will probably scarf half this cake, snarl at my family and then forget it ever happened. I really didn't expect to have to deal with this until I hit 50, so this is a surprise. Did I mention how old I am? No? Oh. Not 50. 2. I foolishly signed up for a 10-mile (not 10K, mind you, 10 m i l e s) race tomorrow with my sister-in-law that I will probably start like a jack-rabbit and end feeling paralyzed because I've done no serious training and still think my body is 25 and can do that kind of thing. But as my hormone levels so kindly reminded me, no. So a baking success was a bright spot. I've made lots of cakes and they've been good, but not without their density issues, namely high density (think banana bread). But not this one. Maybe it's the cake flour or the buttermilk or because I realized you really have to whip the butter, sugar and eggs into fluffy peaks before you add the dry ingredients (which are sifted and undisturbed) and then mix just until combined. I think that's the secret. Anyone? Side note: I found a 10-year-old message thread on a baking site re. how to make cakes light and fluffy and commenters are still going strong. People are quoting Proust and Betty Crocker. Conclusion? Food is a great uniter. Cake, more so. 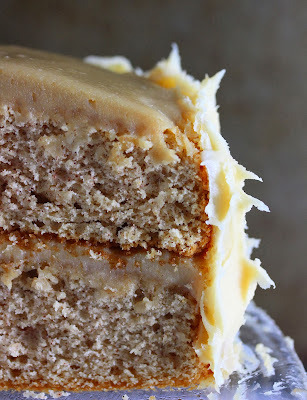 This spice cake is light and fluffy and flavorful and the frosting is simply perfection. Sick perfection. Sugar, butter, cream cheese perfect 10, first love perfection. It looks lighter on the sides than on the top because I made it two ways - one with white sugar and one with brown to see which was better. The verdict? Too close to call. 2. Sift dry ingredients together in a bowl and set aside. 3. Beat butter, sugars, eggs and vanilla in a large bowl until fluffy (5 minutes). 4. Alternate dry mix with buttermilk and beat on low just until blended. 5. Pour evenly into two 8-inch round cake pans that have been buttered and floured. Bake for 30 minutes or until a toothpick come out clean. Let cool 5 minutes in pan then turn out onto wire racks to cool completely. Note: Also works well for cupcakes. Bake for 20-25 minutes—makes about 20. 1. Put sugar and water into a heavy pot (heavy prevents scorching) over medium-high heat stirring until it starts to boil. Once it boils, do not stir anymore. Let bubble for about 7-10 minutes or until it turns golden brown and smells like caramel. Remove from heat and stir in butter until it melts. Then beat on low speed with your mixer until it emulsifies. Add vanilla, cream cheese and salt and beat until creamy. Scrape into a heatproof bowl and cool down (it will thicken as it cools).